Airline passengers will be able to bring many types of cigarette lighters on board flights again starting next month, as federal authorities found a two-year-old ban on the devices did little to make flying safer, a newspaper reported Friday. "Taking lighters away is security theater," Transportation Security Administration chief Kip Hawley told The New York Times in an interview Thursday. Starting Aug. 4, air travelers will be allowed to carry on disposable butane lighters, such as Bics, and refillable lighters, including Zippos, according to the Times. A prohibition on torch-style lighters, which have hotter flames, will continue. Lighters have been barred from checked bags for decades because of concerns that the lighters might start fires in cargo holds. Congress decided to stop air travelers from carrying lighters aboard after Richard Reid used matches to try to light explosives hidden in his shoes while on a Paris-to-Miami flight in 2001. Lawmakers worried that Reid might have succeeded if he had had a lighter. The lighter ban took effect in April 2005. Security screeners now collect an average of 22,000 lighters a day, and it costs about $4 million a year to dispose of them, the Times reported. "The United States previously had been the only nation in the world to prohibit lighters from carry-ons," the TSA wrote in a press release. "Lifting this ban is another step in our efforts to harmonize security measures with international partners." Hawley said confiscating lighters hasn't meant much for security, as other items could be used to detonate bombs. "The No. 1 threat for us is someone trying to bring bomb components through the security checkpoint," the TSA administrator said. "We don't want anything that distracts concentration from searching for that." 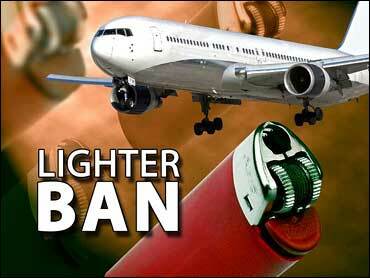 The congressional measure that governed the Homeland Security Department's 2007 spending let the agency stop enforcing the lighter ban if it found that "lighters are not a significant threat to civil aviation security."